Romsley Parish Council have teamed up with West Mercia Police to make Romsley a “We Don’t Buy Crime” village by supplying all households with a SmartWater® kit to protect their homes. SmartWater® is an easy-to-apply liquid that enables the Police to trace valuables back to the owner. A “drop in session” was recently held where villagers could collect their kits. 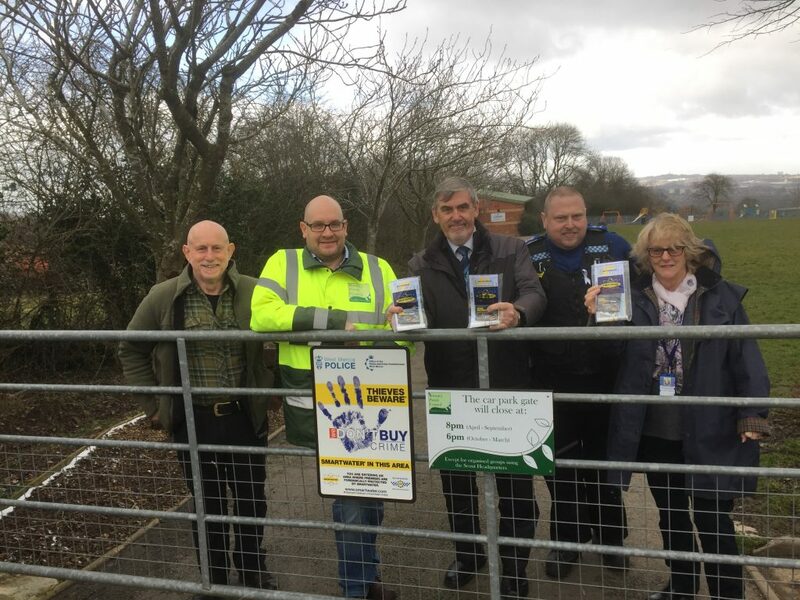 Councillor David Powell said “the drop-in session was a great success where we broke all records for a launch as part of the “we Don’t Buy Crime” project. We are also allowing residents to collect packs at our next Parish Council meeting and arranging further opportunities to collect packs in the future. The Parish Council have utilised grants and part funded the cost of the packs to provide them free of charge. Our aim is to ensure that every household in Romsley is equipped with a Smartwater pack. There will also be signage installed in the village to send a clear message to criminals that Romsley are united and determined to protect our valuables against acquisitive crime. A meeting took place in the village last week between some representatives of both Hunnington and Romsley’s Parish Councils and two representatives of West Mercia Police, namely Inspector Sarah Cotten, from the SNT( Safer Neighbourhoods Team) and local PC Tim Burling. A possible opportunity for all those residents who wish to have items of property marked with Smart Water. The setting up of a Neighbourhood Watch scheme. A flyer in our PC Newsletter giving police advice on self-help measures. A mobile Police van will be in the village on December 12th , opposite the school ( 3.00pm- 7.00pm) and again on December 14th outside Snippet One(3.00pm-7.00pm). This will provide lots of information on the best ways to protect your home and property. An open meeting will be held at the St Kenelms Church Hall on the evening of 21st March with the Police and Community Action Team and again this will provide lots of opportunities to receive information and advice. We were made aware of the following Scam by our Police Liaison Officer. Please be careful when using your personal details. “Wednesday a week ago, a friend had a phone call from someone saying that he was from some outfit called: “Express Couriers”. ( The name could be any courier company. ) He asked if she was going to be home because there was a package for me that required a signature . The caller said that the delivery would arrive at my home in roughly an hour. Sure enough, about an hour later, a uniformed delivery man turned up with a beautiful basket of flowers and a bottle of wine. she was very surprised since there was no special occasion or holiday, and she certainly didn’t expect anything like it. Intrigued, she inquired as to who the sender was. The courier replied, “I don’t know, I’m only delivering the package”. Apparently, a card was being sent separately. ( The card has never arrived! ) There was also a consignment note with the gift. He then went on to explain that because the gift contained alcohol, there was a £3.50 “delivery/ verification charge,” providing proof that he had actually delivered the package to an adult ( of legal drinking age ), and not just left it on the doorstep where it could be stolen or taken by anyone, especially a minor. This sounded logical and she offered to pay him cash. He then said that the delivery company required payment to be by credit or debit card only, so that everything is properly accounted for, and this would help in keeping a legal record of the transaction. He added couriers don’t carry cash to avoid loss or likely targets for robbery. Her husband, who by this time was standing beside her, pulled out his credit card, and ‘John,’ the “delivery man” asked him to swipe the card on a small mobile card machine with a small screen and keypad. Frank, her husband, was asked to enter his PIN number and a receipt was printed out. He was given a copy of the transaction. the guy said everything was in order, and wished us good day. To our horrible surprise, between Thursday and the following Monday, £4,000 had been charged/withdrawn from their credit/debit account at various ATM machines. Apparently the “mobile credit card machine,” which the deliveryman carried now had all the info necessary to create a “dummy” card with all their card details including the PIN number. Upon finding out about the illegal transactions on the card, they immediately notified the bank which issued us a new card, and our credit/debit account was closed. They also personally went to the Police, where it was confirmed that it is definitely a scam because several households had been similarly hit. WARNING: Be wary of accepting any “surprise gift or package,” which you neither expected nor personally ordered, especially if it involves any kind of payment as a condition of receiving the gift or package. Also, never accept anything if you do not personally know or there is no proper identification of who the sender is. Romsley had a successful Neighborhood Watch (NHW) scheme running for many years and the Parish Council would like to get it up and running again. NHW is a partnership which involves the police, community safety departments and local residents who all work together to make their neighbourhoods better places to live. It aims to help people protect themselves and their property and reduce the fear of crime by giving advice on home security, promoting vigilance in spotting and reporting suspicious incidents and fostering greater community spirit. The Parish Council will look to support the costs of this scheme and will provide a dedicated page on the Council website for information on home and personal safety and any anti-crime initiatives affecting the Parish. We will need a number of volunteers to help support this important initiative in our community, if you are interested in helping please contact the Clerk to the Council who will pass your details on to Councillor Lesley Gray.